Just because the snow has fallen and the temperatures are dipping, doesn’t mean that you can’t plan a tented event during the winter. In fact, it is becoming a more popular choice among party planners this time of year. If done right, a winter tented event will keep your guests cozy and warm. When utilizing all of the things that rental has to offer, such as sidewalls, flooring, heating with thermostat controls, and lighting, your guests will forget they are actually outdoors. When planning your outdoor event this time of year, there are some things to keep in mind. Though the winter may provide a different set of challenges than other seasons, these can still be easily overcome with proper planning. Because the weather can be much more unpredictable this time of year, a backup plan is essential. Even though the long-range forecast may call for clear sunny skies, doesn’t mean the temperature can be much colder than expected. Wind is another factor. It may be welcomed in the hot, muggy summer weather, but can make things even more frigid this time of year. For these reasons consider an indoor venue as a backup contingency, or at least be prepared to add more heaters. Conversely, it may be clear and sunny when you are planning your event, but that doesn’t mean it won’t be snowing when the day comes. For that reason, you should make preparations for snow removal prior to tent installation, during the event, as well as during tent removal. Even though it is cold outside, portable restrooms are still a viable option. Some manufacturers take winter into consideration and utilize a saltwater mixture rather than just plain water. Be sure to ask what options are available. Of course, keeping your guests warm is job one. Even smokers or those who wish to step outside and mingle can benefit from a couple of well-placed patio heaters. Take into consideration the season when making lighting choices. Use warm, soft light or candles to create a cozy and inviting mood for your guests. Taking the outdoor temperatures into consideration, why not add a coffee bar in addition to the usual liquid refreshments? You could also offer such things as hot cocoa and tea for the non-coffee drinkers. 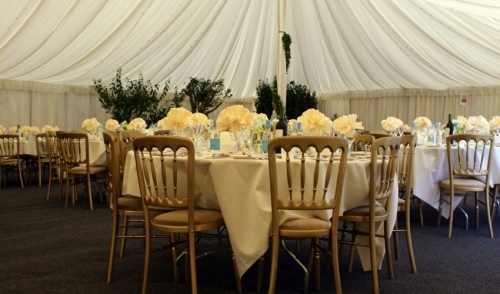 When planning, give us a call and will help you find the tent that will work best for you. We too, will keep a close eye on the weather and ensure that your tent is securely erected, and will keep you and your guests warm and secure regardless of the weather.